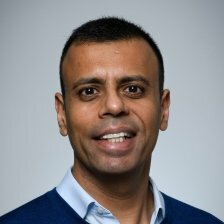 Sacha Deshmukh is Chief Executive of Smart Energy GB, the national public engagement campaign established by government supporting the Great Britain smart meter rollout. He is an expert in consumer engagement, with a career that has included leading major advertising and marketing agencies, as well as national public bodies and charities. Before this role Sacha was Executive Director of the UK Parliamentary Ombudsman Service and senior Partner at the Engine Group. He is also currently Chair of War Child UK, and was previously Deputy Chair of Citizens Advice England & Wales.